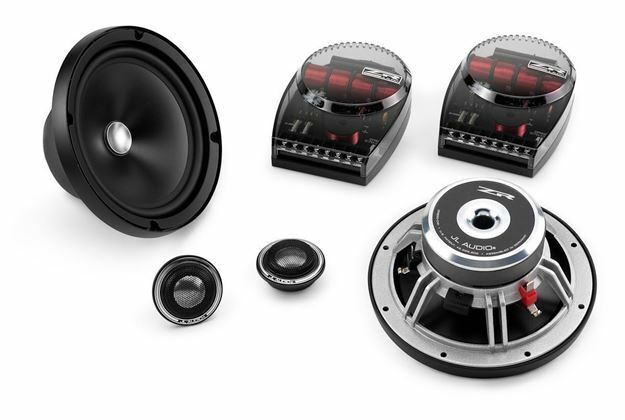 The ZR650-CSi features 6.5-inch (165 mm) component woofers with Kurt Müller cones and suspensions, precision-machined field plates and die-cast alloy baskets. The woofer design benefits from JL Audio's vast woofer design experience and advanced modeling systems. The ZR component tweeters included in this system feature 1-inch aluminum domes with rubber-roll suspensions that damp unwanted ringing while delivering spectacular high-frequency extension. A flush-mounting fixture with a classy electro-formed ring provides a sophisticated touch in any installation. ZR crossover networks are bi-amp capable and built with super-premium component parts, including U.S.-made Mills™ resistors mounted on an extruded aluminum heat sink, polypropylene capacitors, and segmented air-core inductors. Five levels of tweeter attenuation are provided, as well as four levels of mid-range presence adjustment, for twenty possible voicing combinations! Woofer grilles are included, each consisting of a black grille tray and a black steel mesh grille with an electroformed "ZR" logo.